When my little ones get sick the worse sound in the world is hearing them cough due to having a cold. 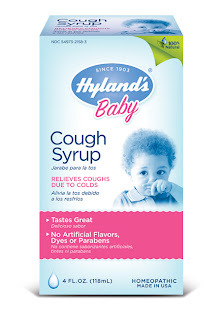 Thankfully Hyland’s launched Baby Cough Syrup for infants 6 months and older. Hyland’s Baby Cough Syrup is designed 100% natural and safe for the entire family and is made to stimulate the body’s own defense and help alleviate cough. My daughter is allergic to Acetaminophen and she is two now; so being able to have something on hand that she can take when she has a cold is crucial. We are no strangers to Hyland’s products, I have used their teething tablets when my daughter was still teething. Hyland’s Baby Cough Syrup contains no artificial flavors and is naturally sweetened with licorice root, vegetable glycerin and sugar beets. love hylands products and would love to try this one! Well written. My thanks for posting that. I’ll check to your site to find out more and tell my people about this.